Studio 85 – Welcome to Calgary’s newest, brightest and shiniest boutique studio! Welcome to Calgary’s newest, brightest and shiniest boutique studio! Located on the second floor of South West’s beautiful Aspen Landing Shopping Centre. 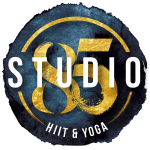 Studio 85 brings a whole new meaning to yoga, fitness and community! We’ve got something for everyone … hot and warm yoga, power yoga, restorative/yin yoga and meditation all the way to High-intensity interval training (a combination of cardio and strength). We promise, “Good things come to those who sweat”!